Helping Babies Breathe is a simple set of skills that saves babies lives after birth by helping them to breathe. Anyone can learn how to do it. The skills are especially useful to birth attendants, doctors and midwives working in rural areas and out-of-hospital situations. The aim is to train enough nurses, midwives and birth attendants so that at the birth of every baby, there is one person who is available solely to help that baby breathe. Research has shown that helping newborn babies breathe after birth helps decrease neonatal mortality rates. An estimated 717,000 newborns die each year from causes related to birth and the inability to breathe immediately after birth. The goal of this training is to have at least one person who is skilled in neonatal resuscitation present at the birth of every baby. 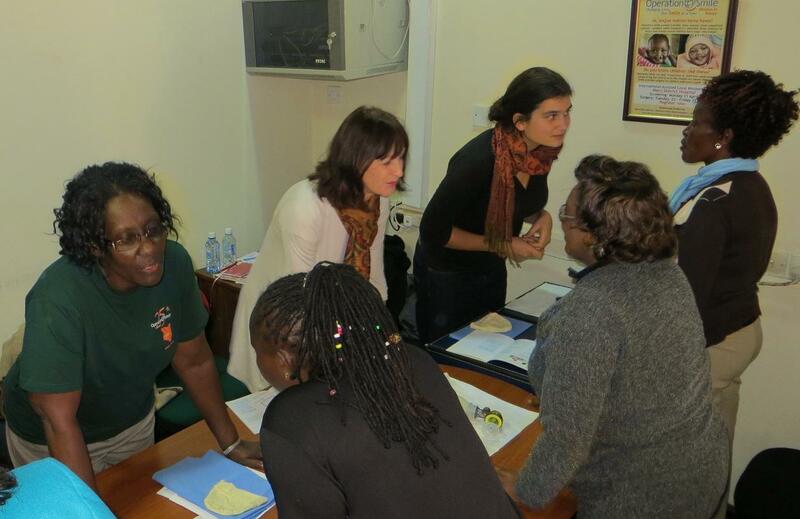 On Wednesday the 26th June 2013, Ruth Ehrhardt and I flew to Kenya to train as “Helping Babies Breathe” facilitators in South Africa. We are very excited about this training, as we have teamed up to volunteer for Operation Smile once a month, training health professionals, birth attendants and parents how to help babies breathe, especially within the first golden minute after birth. Well, breathing in Nairobi is quite an issue, as we found out when we landed after our fantastic flight. We had seen Lake Malawi from the sky (apparently the size of Great Britain according to the passenger in the seat next to mine! ), and circled in flight around the imposingly magnificent snow-capped Mount Kenya. Our breathtaking landing was sealed by car exhaust fumes in bumper to bumper traffic for two hours over a 20km journey! By the time we arrived at the Kivi Kilimani Hotel, we were ‘exhaust’-ed, and quite happy to forego any sightseeing and settle down to supper and bed. The next day it was straight to work to meet our fellow midwives and Tom at the Operation Smile Headquarters. It was wonderful to meet with the team in Nairobi and practice the steps of resuscitating our Neonatalie dolls in the first golden minute after birth. 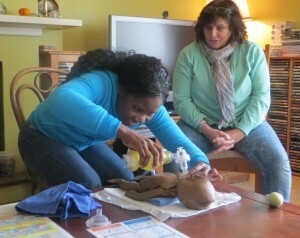 We learned that in many areas in Africa and the world, babies die because no-one knows how to help them breathe. We heard heartbreaking stories from other midwives about the conditions in rural areas: roads are so poor that mothers and babies die on the way to a hospital. In hospitals staff struggle with heavy workloads and lack of resources. We learned how to be respectful of what people have and to adapt to the local conditions. Perhaps the most important of preparation tasks is the act of washing hands to prevent infection. So we spent time teaching each other how to wash hands before resuscitating a baby and laying out our surgically clean field and equipment. By the end of the course we had become friends and were inspired to make a difference! 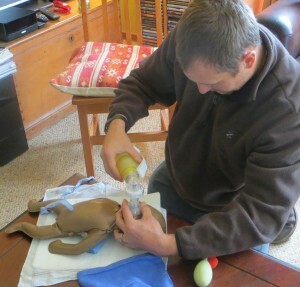 The most important task of all is getting the baby to breathe and as the Neonatalie doll’s chest rises with each inspiration we breathe a sigh of relief. 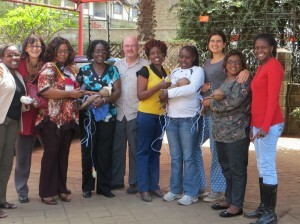 Soon afterwards I put my training into practice with a group of women (and men) at Hilton, in Kwazulunatal. 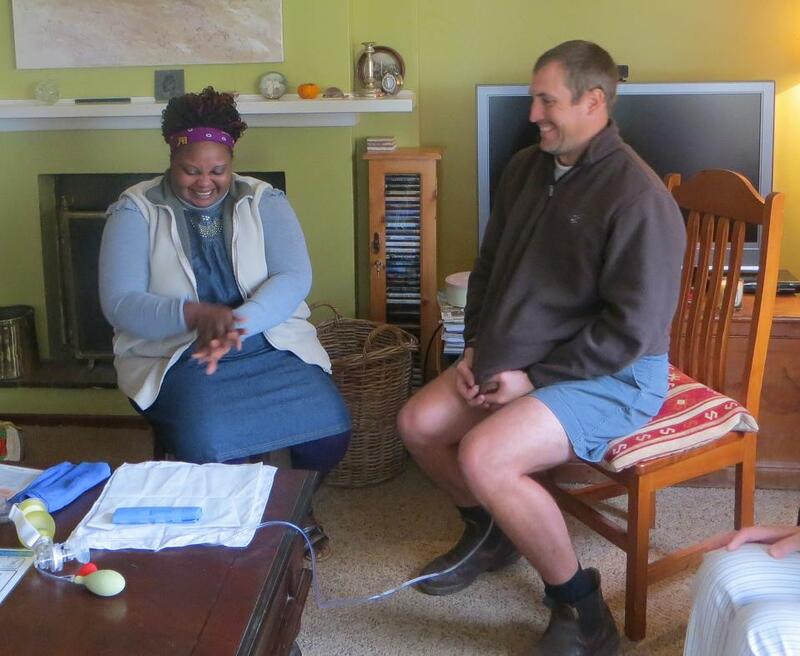 The interactive didactics of the teaching material meant that fathers gave birth too and Gareth took turns amidst much encouragement and laughter. Practice is the key to learning the steps for the first golden minute of a baby’s life and repeating the steps together gave us confidence. 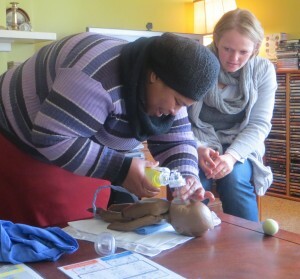 Next month we are off to Mpumulanga to start a Helping Babies Breathe training programme in the area. May the story continue.